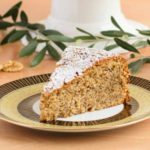 A recipe for an olive oil cake made with walnuts. A moist cake with a light dusting of confectioners sugar on top. It can be served with whipped cream or ice cream. Preheat oven to 350 degrees F. Lightly coat a 9-inch springform pan with olive oil. Place the pan on a rimmed baking sheet and set aside. Place walnuts in a food processor fitted with a knife blade. Chop nuts until finely ground. Transfer the ground nuts to a bowl. Add the flour and baking powder and whisk to combine. Set aside. In the bowl of an electric mixer fitted with a whisk, beat the eggs on medium-high speed until foamy or frothy, about 2 minutes. Slowly add the sugar in increments and beat until light pale yellow and thick, about 4 minutes. Gradually add the flour/nut mixture and beat until just combined. Add the oil, milk, lemon zest, and vanilla. Beat until just combined. Do not over-mix. Pour the batter into the prepared springform pan. Bake until lightly browned and a cake tester or toothpick inserted into the center comes out clean, about 50 minutes. Cool cake completely in the pan on a rack. The center of the cake may sink during cooling. Remove cake from pan and transfer to a serving platter. Dust top with confectioners sugar. Slice, serve, and enjoy.